Life is busy with making and crafting, homemade gifts being packaged and sent off to reach loved ones before Christmas. The kitchen is a jumble of cookie cutters, baking sheets, and loaf pans. Dried fruit, spices, and cookie sprinkling won’t find their way back to the pantry shelf until after the festivities. Butter, eggs, and cream fill the fridge…thank you, thank you, to our flock of layers, their contribution to these holiday confections is very much appreciated! In between the kneading and stirring, I am clicking needles fast and furious to finish the requested wool socks and hats that will be gifted. Such fun, all of this! 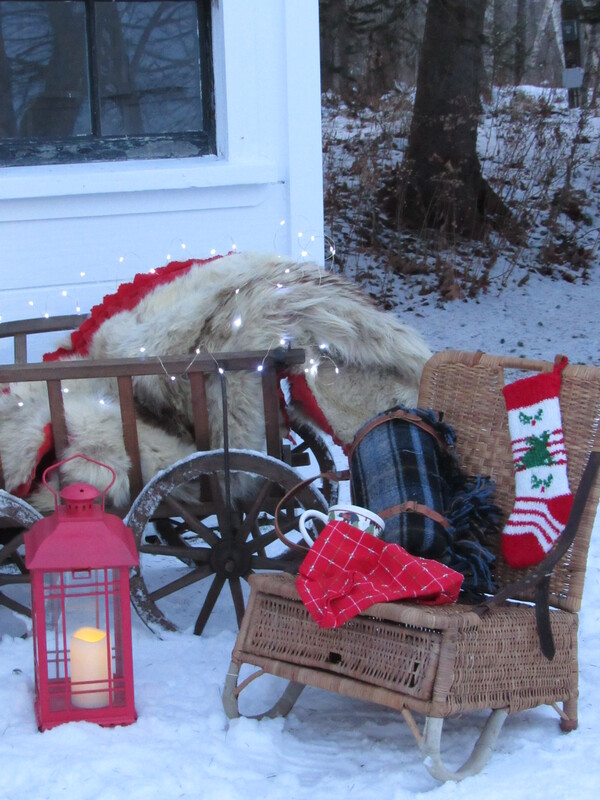 Then, of course, there are moments of silly whimsey and we haul out the red Christmas blankets and the old wooden wagon and the Sterno stove for a little tea party while the snow cover is still good ( rain coming, yuk!). Happy Holidays everyone! Hope your season and the new year is filled with merry and delight! A week ago we had an open studio day where many showed up to practice their craft. What fun! 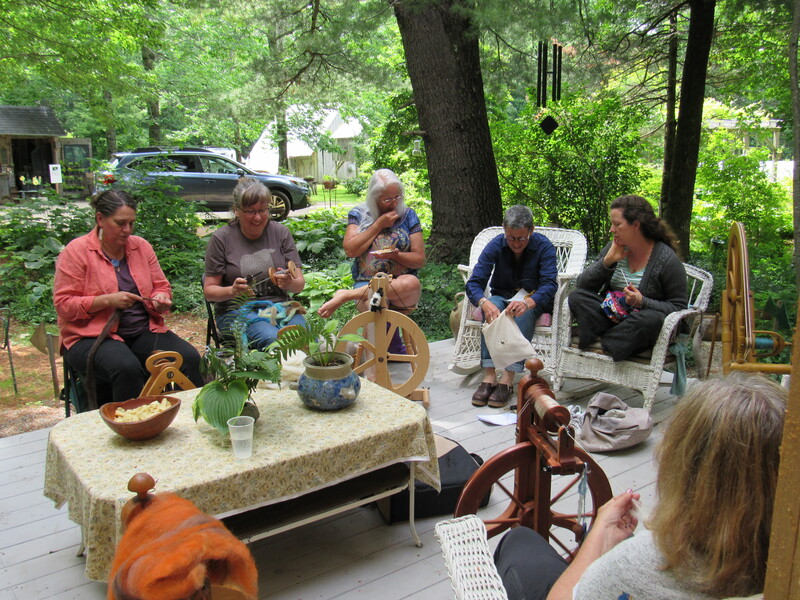 It had rained the night before, a long generous rain which we desperately needed, but it cleared by mid-day to allow for the studio deck be a place for spinning, knitting, and drawing. I think there were at least 8 spinning wheels whirring, several knitters clicking away, and a new friend ( Hello, Boots!) working on her postcard-a-day drawings. Of course, there were snacks to keep us all well fed and hydrated! 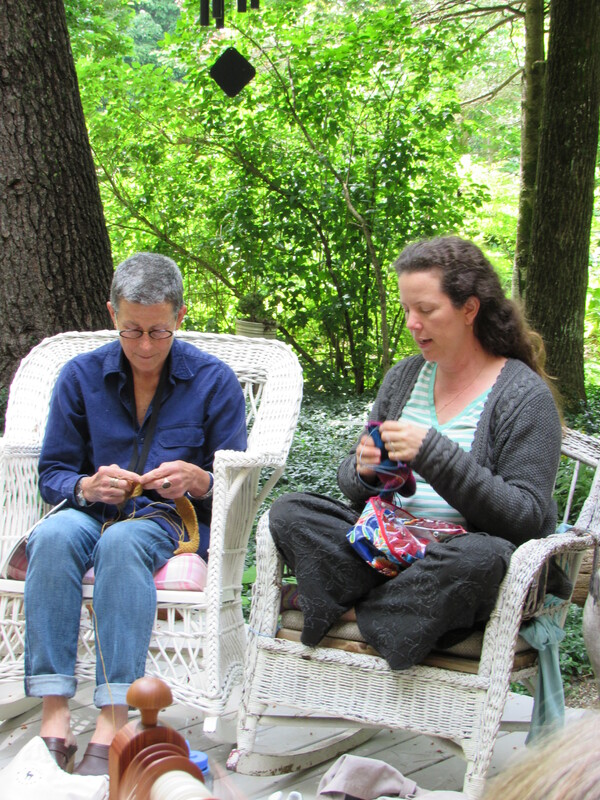 It is often so hard for me to take a moment away from the gardens and the nursery to sit and spin wool or knit during the summer season. The studio takes a back burner during these precious growing months. Having an event like this allows for those wonderful opportunities to visit with friends and makers, share ideas and projects, and to be inspired by all the fabulous and creative talent that surrounds us here in Maine. 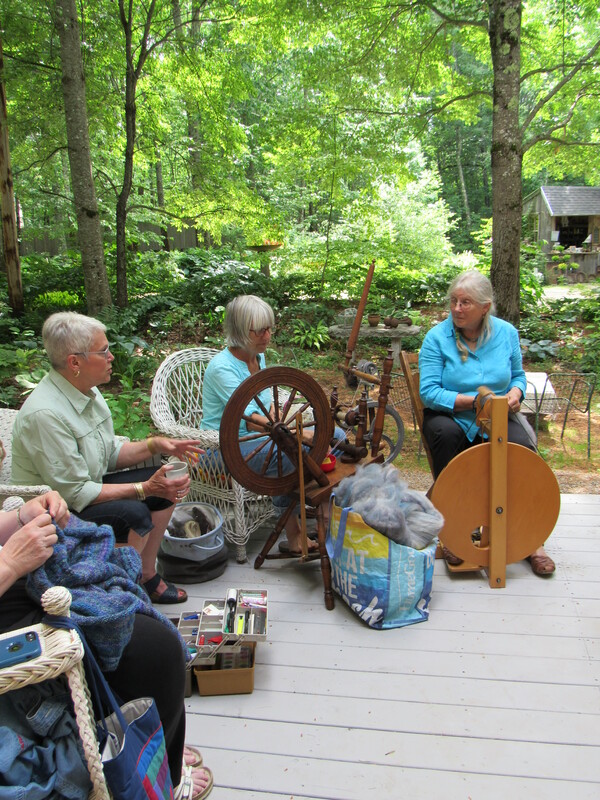 I did not know that the little town of Jackson has a healthy band of spinners who are willing to pack up their wheels, their fiber and needles, to make their way over to Montville for an afternoon of spinning and knitting. Such a fun bunch! Two blogging friends came from miles away…loved spending time with you both, Sarah and Brenda! So, now I know that I need to schedule another day of ‘spinning and making’! I’m thinking August. 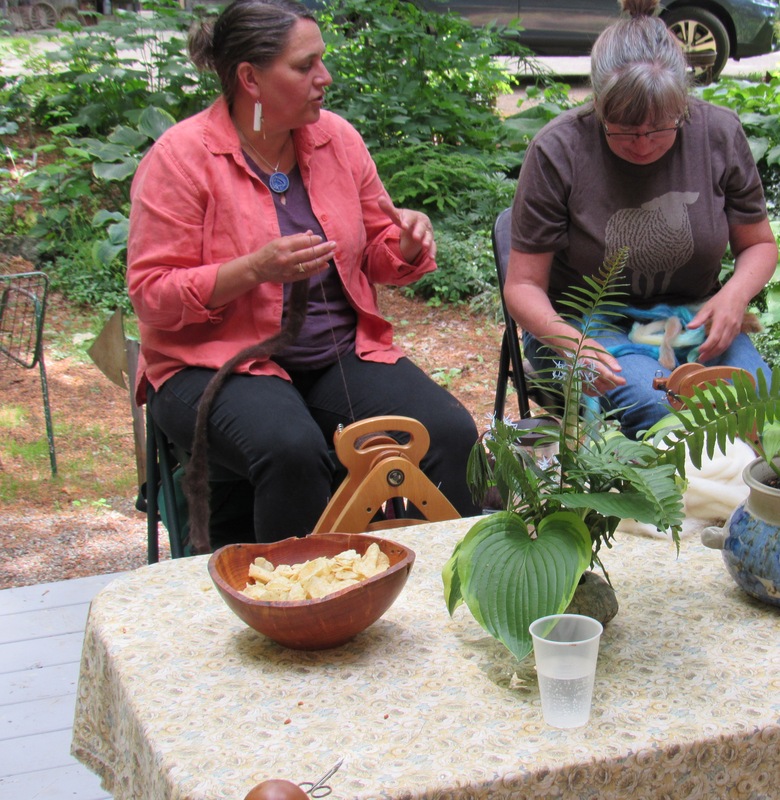 A day when the summer begs to sit on the porch with friends and share in the spirit of making. We are nearing the end of our lambing schedule, awaiting our last few ewes to deliver. So far, we have had 9 lambs…… 6 ewes and 3 rams, all easy births and all healthy. After a long winter and tending to our original flock, it is a delight to go out and be greeted by a bunch of springy lambs frolicking about. It amazes us that within a couple of days from being born, they are racing back and forth, jumping into the air, and chasing each other around. Wallace ( remember him?) looks around now with a dazed expression and instead of a ” Did I do that ? ” it’s more like a ” what have I done ? “. We love watching them all. 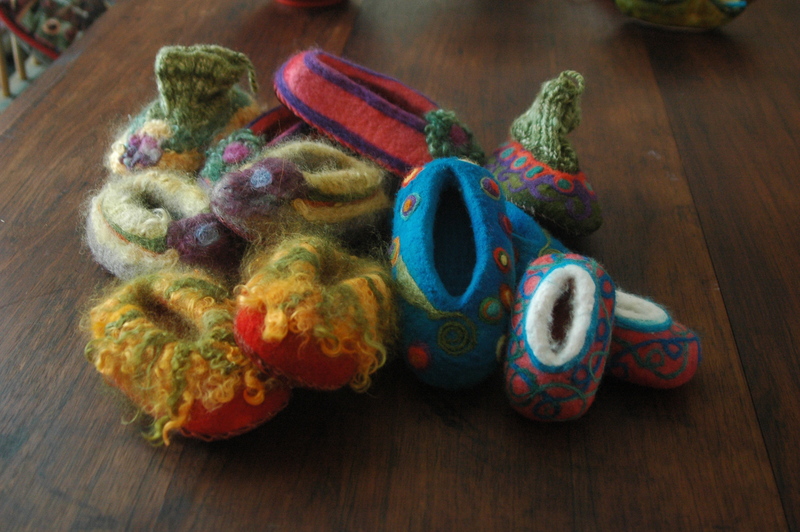 Indoors, these are some examples of the felting projects I have been working on. 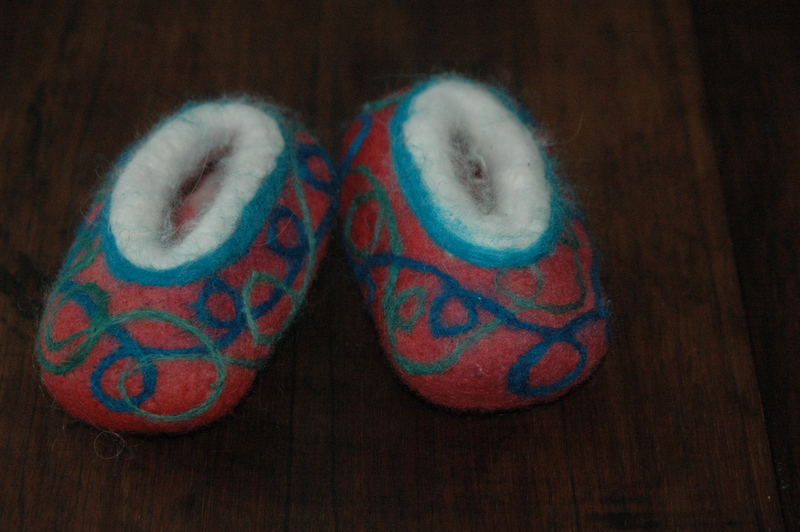 The slippers are made by a process called wet felting. I spent some time this winter working on a slipper pattern that I was happy with and then carded my wool into batts for felting. The process involves using hot soapy water , layering the wool batts, and then a lot of shaping by hand. 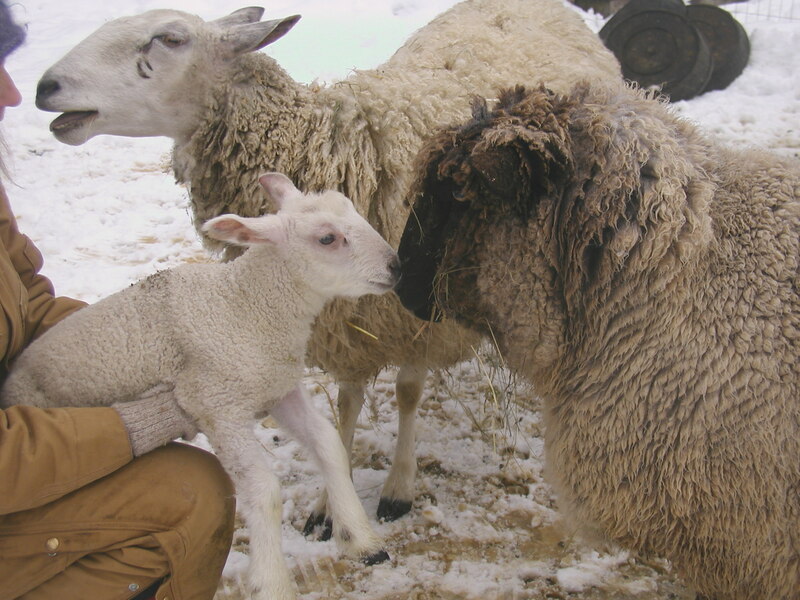 Wool typically felts by being subjected to three things: temperture change, alkaline, and agitation. Many of us have experienced this when putting a wool sweater into the washing machine. Usually what comes out, if the sweater is 100% wool, is a smaller, tighter, woven version of what was put in. Well, that’s basically felting. 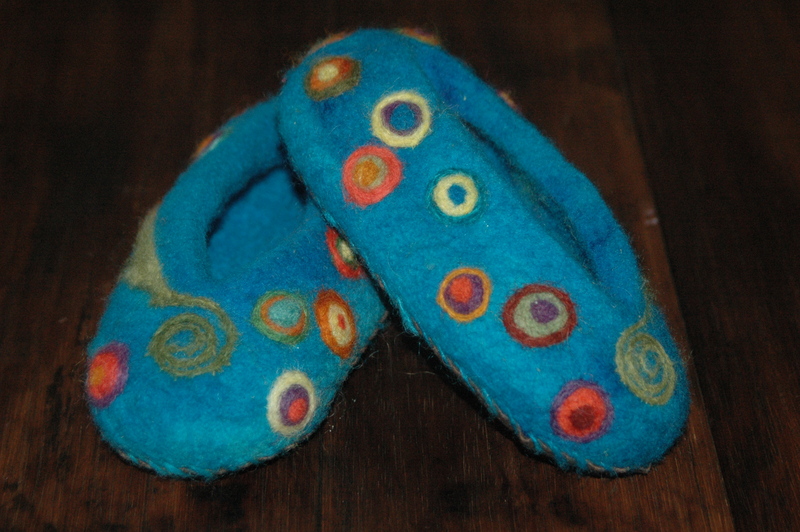 The slippers I have been working on are all hand felted and dyed using some of the fleeces that best lend themselves to this process. 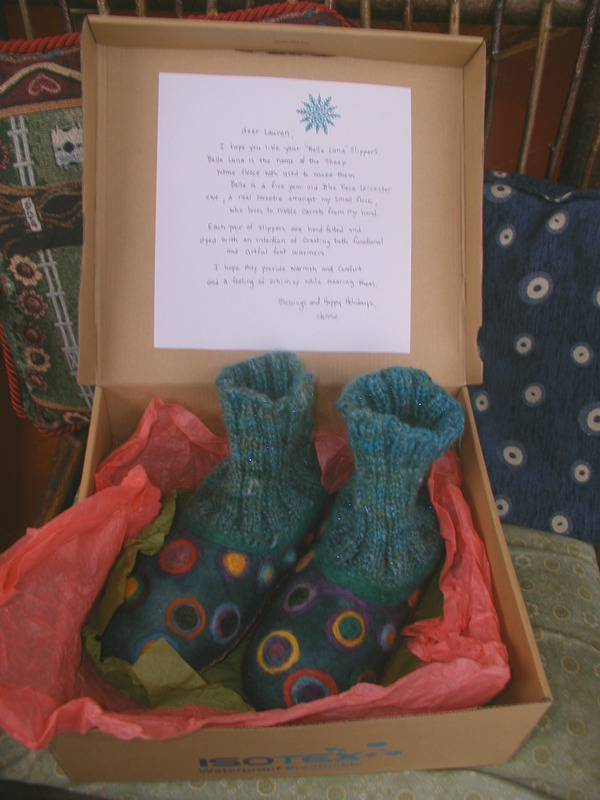 Felt is a great fabric….warm and sturdy and tends to shed water due to the wool fibers being so densely shrunken and tightened. This resulting in a material that is perfect for keeping feet warm during our Maine winters. 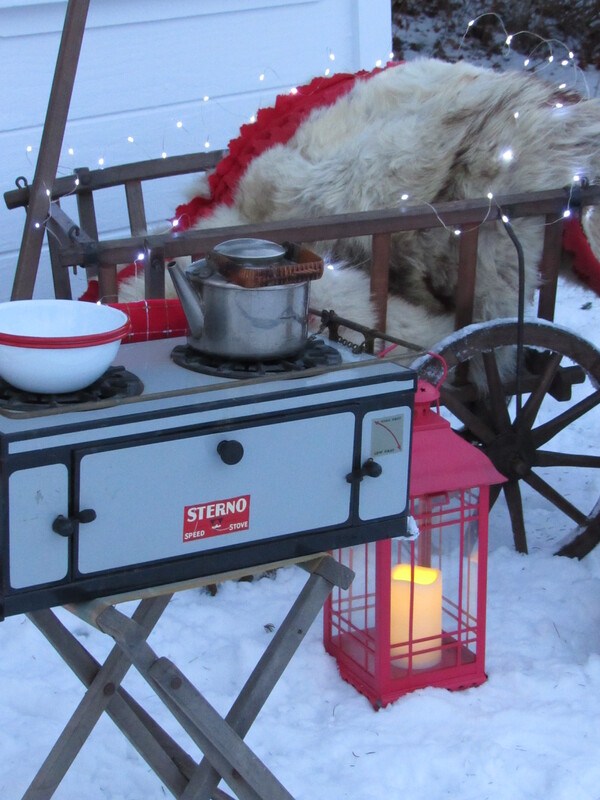 Maybe next winter I’ll felt a yurt.